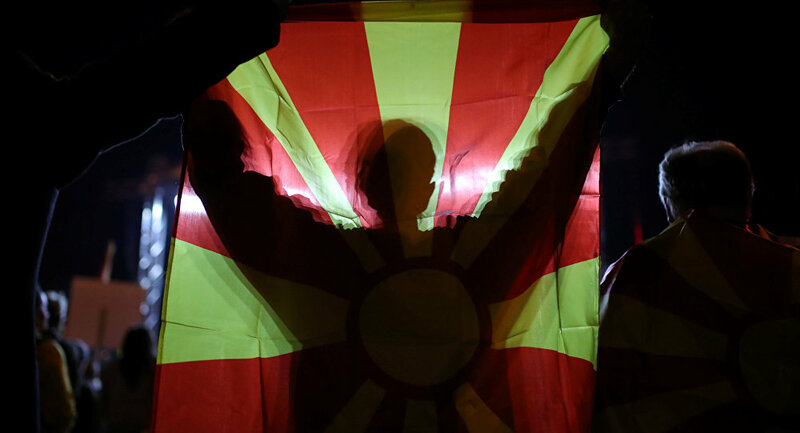 MOSCOW (Sputnik) - Macedonia's opposition has won as the turnout at the referendum on the country's name change was considerably lower than the legally required 50-percent threshold, Dr. Janko Bachev, the president of United Macedonia opposition party, told Sputnik. The majority of the people who showed up to vote on Sunday backed the name change, but the turnout was around 37 percent, according to the State Election Commission, which is less than the 50 percent needed to validate the results of a non-binding referendum. Prime Minister Zoran Zaev nevertheless said that the result signalled a triumph of democracy and of a "European Macedonia," and pledged to proceed with the name change. "Yesterday, we defeated the puppet government controlled by the foreign center… Although the puppet-government wants to twist the truth and present the referendum as successful, the truth is that turnout was very low and the referendum has completely failed," Bachev, who led the campaign to boycott the referendum, said. Bachev said his party's observers recorded a turnout figure of less than 33 percent. The opposition politician alleged that there was illegal voting in some places with a large Albanian population in the afternoon. According to Bachev, the majority of Macedonians were not interested in EU or NATO membership which would open up for the country if it changes its name and thus resolves the dispute with Athens. Dr. Janko Bachev also said that the country's government might be planning to bribe 10 Internal Macedonian Revolutionary Organization – Democratic Party for Macedonian National Unity (VMRO-DPMNE) lawmakers to ensure that the country's constitutional name change is backed by the parliament. The VMRO-DPMNE coalition, which opposed the name change, holds 51 seats in a 120 seat parliament. The Social Democratic Union of Macedonia (SDSM), led by Prime Minister Zoran Zaev, a strong supporter of the name change deal with Greece, has 49 seats. According to Bachev, SDSM and the Albanian parties represented in the parliament together could gather 70 lawmakers’ votes, while 80, or two-thirds of the total, are needed to amend the constitution. "We have information that they plan to bribe 10 VMRO-DMNE MPs, for 2 million euros each [about $2.3 million]," Bachev, who led the campaign to boycott the vote, said. Bachev said the opposition had a plan to prevent this from happening. "We must win this fight since it’s not a fight for leaders and power but a fight for a survival of our people," the president of United Macedonia said, adding that Macedonia’s historically great name should not be taken from it and erased from the world map. Zaev said he might call for snap election if the parliament failed to approve the name change deal after Sunday's referendum on the matter failed to reach the 50-percent turnout threshold. Bachev pointed out, however, that the prime minister would have to resign 100 days before the election, and opposition VMRO-DPMNE would then gain control over several ministries. "Most likely [outcome] is that VMRO-DPMNE will require that condition to be respected and therefore elections are most likely not to be held in November," the politician said. In June, Macedonia and Greece signed an accord on renaming the country to the Republic of North Macedonia. The deal resolved the decades-long dispute between Athens and Skopje over the use of "Macedonia," which is also the name of a region in Greece. The Macedonian parliament ratified the deal on name change in July, paving the way for the September 30 referendum on the country's NATO and EU membership. The possibility of accession was earlier impossible due to the naming dispute.